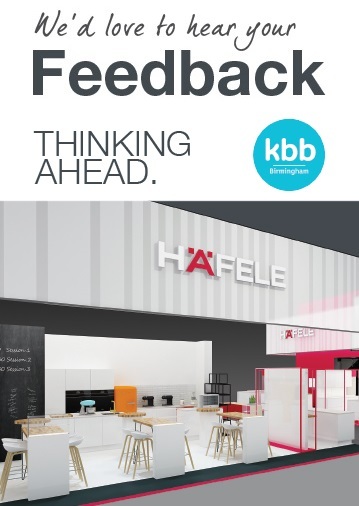 We'd love to hear your thoughts on your experience at the Häfele stand at KBB 18. Provide us with some quick feedback and you could be in for a chance to win £50 worth of vouchers. Complete the survey here. This incentive is open to people who are UK residents aged 18 years and over, excluding employees of Häfele UK (the ‘Promoter’) and their affiliates or agents and their families. The incentive opens at 12.00am GMT on 04/03/18 and closes at 12:00am on 13/03/18. Any entries received after this time and date will not be eligible for the incentive. To enter and win the prize, complete the Survey Monkey link within this news post (KBB Feedback Survey 2018) or complete the physical KBB Feedback Survey form and hand to a member of Häfele staff at the KBB 18 exhibition. There will be 1 (one) winner in total which will be selected at random from all eligible entries. The selected winner will win a £50 Love To Shop voucher.